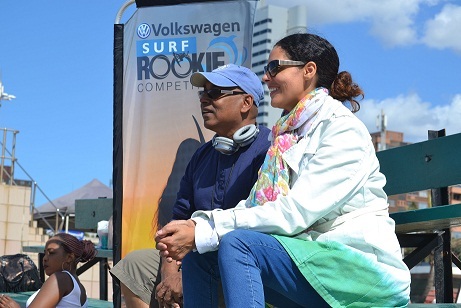 The film centres on a beautiful 20 year-old Indian girl, Sunitha who comes from a traditional Durban family who defies her father, to become a competitive surfer. On the beaches she discovers a whole new world of inter-racial love, ethnic diversity, arranged marriages, conflict and friendship. Her father’s heart is eventually softened by her skill for the sport and near-death experience. And in the end she wins her struggle for self-expression and self-fulfilment and gains her father’s approval and the man of her dreams. The film stars Cape Town-based actor Greg Kriek as Cory, the main love interest, and Durban-born, Cape-Town based Carishma Basday as Sunitha. Kriek has over 40 screen acting credits to his name and will soon be seen in the next instalment of Universal Studios' Tremors as "Dutch", in 20th Century Fox's Maize Runner: The Death Cure, Pureflix's Samson as one of the leads "Caleb" and also stars as Tony Sinclair in the upcoming biopic Serengeti Rules from Oscar winning production company Passion Pictures. Well-known South African actress Carishma Basday, a presenter on the popular Mela magazine show on SABC3, has many film and commercial credits to her name. Equally at home on stage and screen Casrishma has featured in films 31 Million Reasons (directed by John Barker) and starred in her first leading role as the love interest of famed comedian Riaad Moosa in Material directed by the award-winning Craig Freimond.